Kevin Casey of Bristol Hills Outfitters wrote us again… Hey guys, thought I would share some more photos with you. 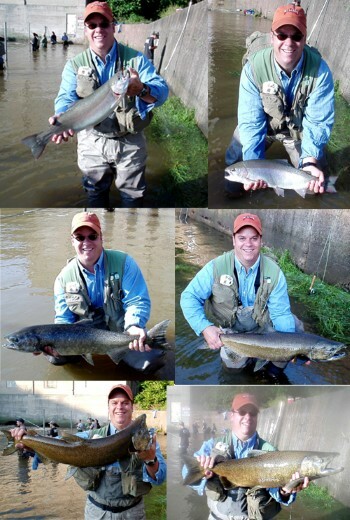 All fish caught and released on a size 10 Daiichi X510 Estaz fly. Not a bad morning! Only fished for 3 hours we were able to play and land 3 steelhead and over 20 Salmon. If you would like I can send you photos of the fly used. Let me know. 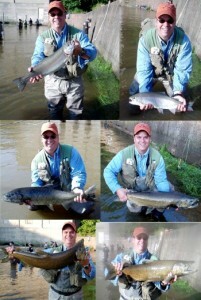 All fish were caught at Oak Orchard Creek. Well Kevin, Not a bad morning INDEED! See Kevin`s fly (the “Egg-Citement”).